What's inside a counterfeit Macbook charger? After my Macbook charger teardown, a reader sent me a charger he suspected was counterfeit. From the outside, this charger is almost a perfect match for an Apple charger, but disassembling the charger shows that it is very different on the inside. It has a much simpler design that lacks quality features of the genuine charger, and has major safety defects. Inside a counterfeit MagSafe 45W charger. The counterfeit Apple chargers I've seen in the past have usually had external flaws that give them away, but this charger could have fooled me. The exterior text on this charger was correct, no "Designed by Abble" or "Designed by California". It had a metal ground pin, which fakes often exclude. It had the embossed Apple logo on the case. The charger isn't suspiciously lightweight. Since I've written about these errors in fake chargers before, I half wonder if the builders learned from my previous articles. One minor flaw is the serial number sticker (to the right of the ground pin) was a bit crooked and not stuck on well. This counterfeit MagSafe 45W charger has the same 'Designed by Apple in California' text as the genuine charger. Unlike many fakes, it has a metal ground pin (although it isn't connected internally). To the right of the ground pin, the serial number label is a bit crooked, which is a hint that something isn't right. The photo below shows the safety certifications that the charger claims to have. Again, it looks genuine, with no typos or ugly fonts. 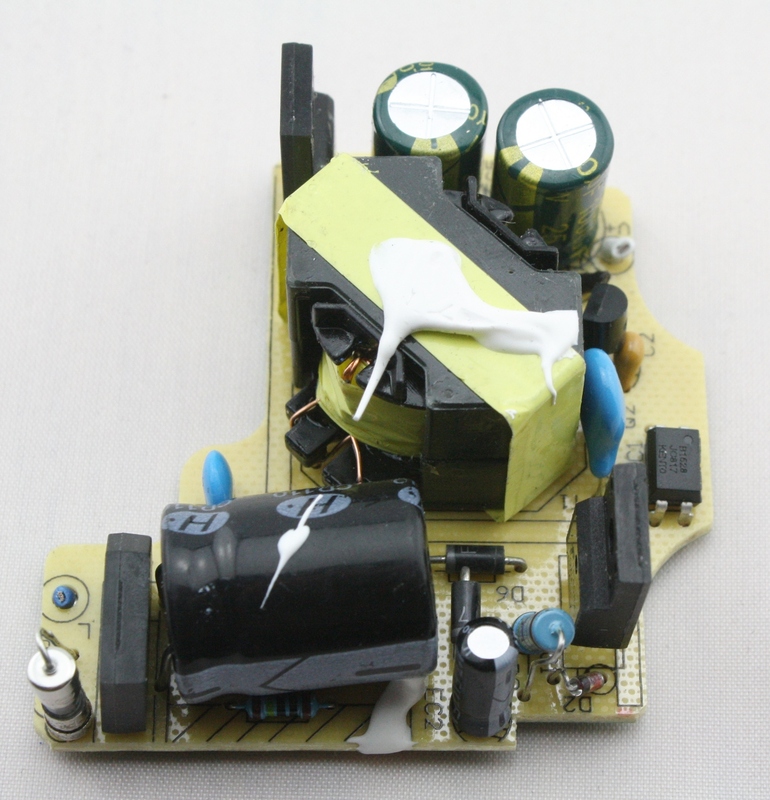 The counterfeit power supply has all the same safety indications as a real power supply. One flaw that made the original purchaser suspicious was the quality of the case didn't seem up to Apple standards. It didn't feel quite like his old charger when tapped, and the joints appear slightly asymmetrical, as you can see in the picture below. The seams in a counterfeit Magsafe power supply are a bit asymmetrical. A problem showed up when I plugged in the charger and measured the output at the Magsafe connector. I measured 14.75 volts output and got a spark when I shorted the pins. Since the charger is rated at 14.85 volts, this may seem normal, but the behavior of a real charger is different. A Magsafe charger initially produces a low-current output of 3 to 6 volts, so shorting the output should not produce a spark. Only when a microcontroller inside the charger detects that the charger is connected to a laptop does the charger switch to the full output power. (Details are in my Magsafe connector teardown article.) This is a safety feature of the real charger that reduces the risk from a short circuit across the pins. The counterfeit charger, on the other hand, omits the microcontroller circuit and simply outputs the full voltage at all times. 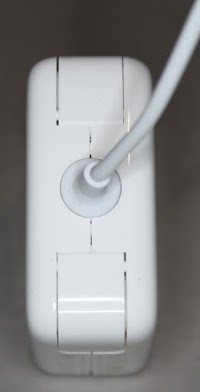 This raises the risk of burning out your laptop if you plug the connector in crooked or metallic debris sticks to the magnet. Cracking the charger open with a chisel reveals the internal circuitry. 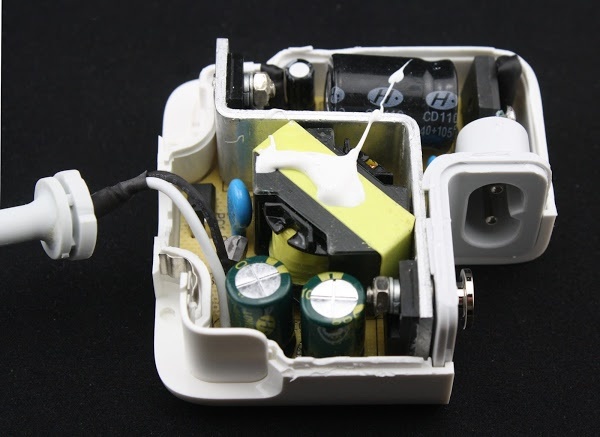 A real Apple charger is packed full of complex circuitry, while this charger had a fairly low density board that implemented a simple flyback switching power supply. A view of the counterfeit MagSafe charger with the case and heat sink removed. The circuit is a fairly standard flyback power supply. To understand how it works, look at the diagram below, going counterclockwise from the AC input on the right. After going through a fuse, the power is converted to DC by a bridge rectifier. The large filter capacitor smooths out the DC. Next, the switching transistor chops the DC into pulses, which are fed into the flyback transformer. 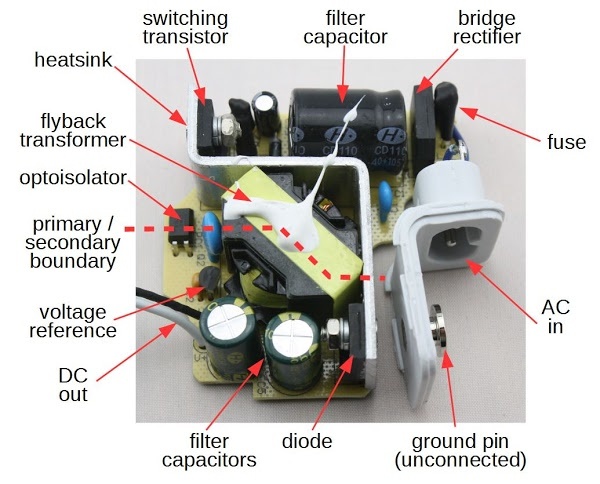 The transformer's low-voltage output is converted back to DC by the output diode. The output filter capacitors smooth the DC output. 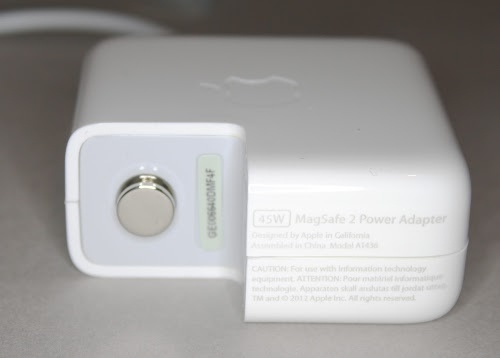 The counterfeit Magsafe power supply uses a standard flyback switching power supply circuit. AC enters at the right and is converted to DC. The switching transistor sends pulses into the flyback transformer (center), which produces the low voltage output (left). A TL431A voltage reference generates a feedback signal from the output, which is fed to the control IC through the optoisolator. While this circuit may seem complex, it's pretty standard for a simple charger. 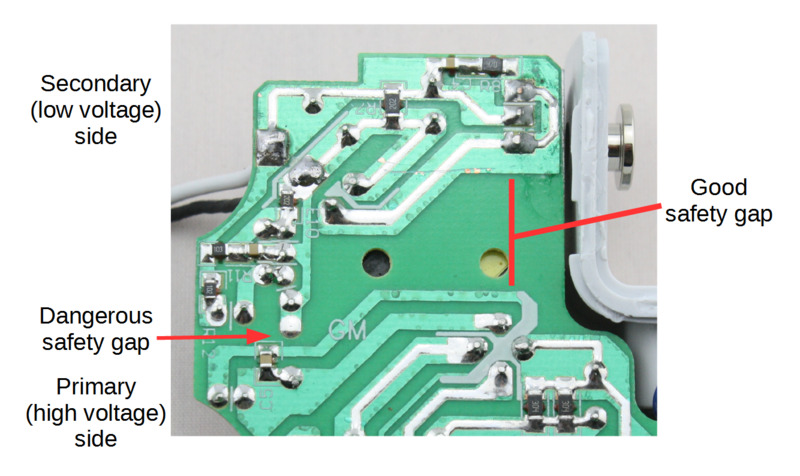 A genuine Macbook charger on the other hand has a much more complex circuit, as I describe in my teardown. 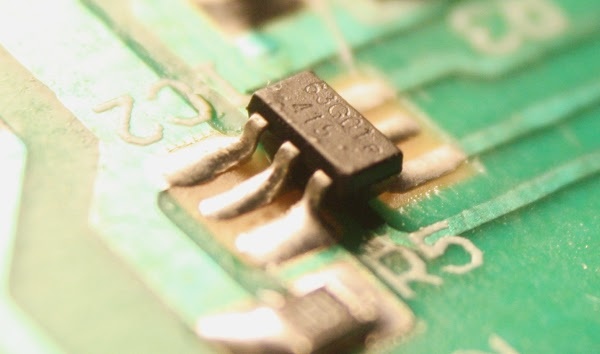 Closeup of the tiny control IC inside a counterfeit MagSafe 45W power supply. The most important feature of a charger is the isolation between the potentially-dangerous AC input and the low-voltage output. High voltage and low voltage should be separated by a safety gap of at least 4mm (to simplify the UL's creepage and clearance rules). On the circuit board below, the high voltage input section is at the bottom and the low voltage output section is at the top. On the right half of the board, the two sections are separated by a large gap, which is good. On the left, there should be a gap (bridged by the optoisolator). Unfortunately, traces and components pass through this area making the gap dangerously small, under 1 mm. Any moisture or loose solder could bridge this gap sending high voltage to the output. The counterfeit MagSafe charger has a dangerously small distance between the low voltage side (top) and the high voltage side (bottom). This is why you shouldn't buy counterfeit chargers. I'm puzzled as to why counterfeit chargers never manage to have sufficient clearance distances. They use simple, low-complexity circuits so the circuit board layout should be straightforward. Except in the smallest cube phone chargers, they aren't fighting for every millimeter of space. It shouldn't take much additional effort to make the boards safer. The second safety flaw is the heat sink that provides cooling for the input-side MOSFET and the output-side diode. The heat sink is basically a giant conductor between the two sides of the circuit, with only small gaps separating it from active parts of the circuit. As well as having large creepage and clearance distances between high and low voltages, genuine chargers also make extensive use of insulating tape for separation. The counterfeit charger lacks extra insulation, except heat-shrink tubing around the fuse and fusible resistor. I didn't disassemble the transformer, but I expect it also lacks the necessary insulation. The counterfeit charger has a metal ground pin (unlike other fakes I've seen that have a plastic pin). However, the pin is just for appearance and is not connected to anything. Comparison of a counterfeit MagSafe 45W charger (left) and a genuine 60W charger (right). The genuine charger is crammed full of components, while the counterfeit just has a few components. I measured the output power from the counterfeit charger with an oscilloscope, while drawing 15 watts. As you can see below, the output power is not smooth, but has pairs of large spikes when the switching transistor turns on and off. The charger operates at a frequency of about 60 kilohertz. More filtering inside the charger reduces these voltage spikes, but would cost more. The switching power supply operates at about 60 kilohertz, producing large voltage spikes in the output. You can see a spike when the transistor switches on, followed by another spike when it switches off. The oscilloscope trace below zooms in on one of the spikes. You can see that the spike measures 2.7 volts peak-to-peak, which is a lot of noise to be feeding into your laptop. The output of the counterfeit charger has large 2.7V noise spikes when a transistor switches internally. This counterfeit Magsafe charger is convincing from the outside, with more attention to detail than most. Until I opened it up, I wasn't completely sure that it was counterfeit. But on the inside, the difference between the counterfeit and real chargers is clear. The counterfeit has a much simpler circuit that provides poorer-quality power. It also ignores safety requirements with less than a millimeter separating you and your computer from a dangerous shock. While counterfeit chargers are much cheaper, they are also dangerous to you and your computer. Thanks to Richard S. for providing the charger. I've written a bunch of articles before about chargers, so if this article seems familiar, you're probably thinking of an earlier article, such as: Magsafe charger teardown, iPhone charger teardown or iPad charger teardown. You can follow me on Twitter and find out about my new articles. For those who care about the component details, the MOSFET is a 600V, 7.5A transistor from Fairchild (FQPF8N60C datasheet). The optoisolator is a Kento JC817 (datasheet). The output diode is a NAMC MBRF10100CT 10A 100V Schottky barrier rectifier. I was unable to identify the control IC, which is marked with "63GO1 415". The Y capacitor (blue) is JNC JN472M 250V 4.7nF capacitor. Unmarked IC Is likely a PWM (pulse width modulator). Decided to measure the voltage on a genuine looking magsafe charger. It had the grounding bit and "proper" LED charging behavior as well as markings. 16ish V, spark, dead. Now I know! Just ordered a proper one from MacMall. You might have saved me from a nasty surprise. I lost a motherboard to a counterfeit charger. When I examined it afterwards it was even worse than the one you examined. It was putting out too high a voltage continuously. I'm shocked by the quality of genuine chargers too. No line filters to speak of. I had one of the ethernet over powerline things and there was loud noise in my headphones on any transmission. Now I always add one or two snap on Ferrites on any mac charger. On both sides, for good measure. Totally kills off any powerline noise. Weight was about 20 gram less than the one that came with the computer. the "415" is probably a date code. Anonymous: good work identifying the control chip as the OB2263! I checked the charger's circuit against the 2263 datasheet and the pinout and circuit fit perfectly. In addition, the datasheet says the chip is labeled with "63ddd" where ddd is a date code, which matches the "63G01" on the chip. Interestingly, the datasheet says the chip is designed for supplies under 30 watts, while the charger was advertised as 45W, which makes me suspicious about how much power the charger could actually provide. The knockoff is not a charger, it is a regulated power supply. but any other chemistry. like any Lithium, would be very problematic, to say the least. Moreover, this knockoff is not any "cheaper" it is the wrong species. Price comparisons are irrelevant unless the things are equal. Charging Lipos from this may well result in a fire. wow there, anonymous lipo guy: laptop batteries have their own dedicated electronics on the mainboard (or partly inside the enclosure if removeable). That is not compareable to raw lipo cells as used in quadcopters etc. I wish someone had done similar teardown of mbp preunibody batteries, the genuine one, and the fake one. I mean not just the teardown (some time ago I disassembled the original battery, and I want to do the same with another one sold by chinese ebay seller as original, but with some slight oddity in one place in typography, and the battery didn't serve very well actually). a thorough analysis of schematics was really interesting to read. I am the OB2263 Anonymous. I've designed a 60W flyback converters using this controller and it worked perfectly, even with synchronous rectification (using FAN6204). The 30W "limit" is only a ball park recommendation - people mostly design on flyback topology at this power levels. All you need to use OB2263 up to a 100W flyback is a properly designed flyback coupled inductor ("transformer") with proper snubber and a good MOSFET. So I believe the PSU could easily spit out the advertised 45W. I would say that if a bit of more thought would have been given to the design, it would be in fact better than the original overly complicated (and not very reliable) Apple PSU. There are lots of new chargers being sold all over the web labelled as 'Genuine', even Amazon. Are these ever real, does Apple ever sell into this channel? Thanks for the article. I bought one of these supposedly genuine chargers from eBay UK and now it is going to be replaced by one from Apple. Another way to tell whether the charger is really correct (if you bought one and don't want to crack it open before returning it or taking your chances) is to check out AboutThisMac/System Report/Power and skip to the end to the AC Charger Information. In an Apple charger you'll find the tabs id/wattage/revision/family/serial number all populated and in a fake they are all blank. Would I do any damage to my MBA using one of these knock offs for a couple of charges? Or is it just the risk of shorting? The most often failure mode of those cheap fake chargers is breakthrough of the switching MOSFET because of either underrated MOSFET, poorly engineered snubbers and/or inadequate filthering of voltage spikes from the mains. When this happens, the core fully saturates, then fuse blows, primary is freewheeling and full magnetic field stored in the core is dumped into the secondary side, generating a short overvoltage peak that could theoretically get to the macbook, but is usually dampened in output caps and cable inductance. The real danger of those chargers is inadequate insulation between primary and secondary side: either the clearance on the PCB, or mechanical construction, or poorly made flyback "transformer" - which I consider most dangerous as it is hard to get checked without using special equipment - a megger. Loosing MBA is nothing in comparison with loosing a life. I got a suspicious "genuine" Apple 85W adapter from Groupon Goods that output full voltage all the time. I returned it. I ordered another "genuine" Apple 85W adapter in bulk packaging from OWC and I suspect its also a counterfeit. I haven't tested it yet though. Check output voltage witch iStat. Fake had circa 17,5 V instead of circa 20 V.
I've met "genuine" Apple 85W adapter from Allegro (Polish ebay thing). I started feeling suspicious after opening the package: there was no original box or characteristic "rectangular" cord tape. Build quality was also not so Apple'ish. I've went to official Polish Apple service and there they couldn't say if the adapter genuine or not. After some research I've decided to measure the output voltage and I've installed iStat. In the app measurments said the output voltage is 17,5 V which was odd, because every adapter I've checked has circa 20 V output. did you tried to read out the Adress of that chip inside the Magsafe plug? Your mac-book is great i use and enjoy allot thank for share it how to build mobile website . I purchased a used 60 magsafe 1 power supply and I opened it. Could you guys help me identify if it is a fake or not? It looks different than the original one in the article, but probably there is at least a handful of revisions since the charger is in production for years and there are different manufecturers. The charger made by dongguan samsung. Hi Unknown! Your charger looks real to me. Apple has multiple versions of each charger (probably so they can negotiate one manufacturer against another), so don't worry that the photos don't match. Signs that it is real: Your charger is crammed full of parts with many ICs - they aren't trying to save money. Lots of insulation between primary and secondary sides - the slots in the PCB and the plastic insulators. Heat-shrink insulation where the AC wires are soldered to the plug. So I think you're okay. This looks more similar to yours, this one made by Delta. On the circuit board there is "PP05" written, on yours there is "PP07", I think this shows which revision is the charger. And here is an other picture of the previous charger from the other side in case of somebody is interested. I am glad I found your blog, there are a lot of interesting stuff! Thanks for posting the photos, Alfréd. With that component density, they're clearly Apple chargers and not counterfeits. I just had a genuine apple charger completely die on me when most needed. I have never had a counterfeit charger die out on me in over 10 years of use (several of them used during this time and the 10 year old one still working). Like apple keyboards, which several have died out on me, apple can overcomplicate things which makes them unreliable. As long as the power supply is putting out the correct voltage, chances are that things will be ok. Lets not overcomplicate basic electronics. Also, note apple only warranties things for 1 year, which is a month or so short of what my genuine charger lasted, which never left the house and was on a surge protector. Same here. Just lost it after about a month of fake charger use. I bought an 85W MagSafe 2 from OWC aka Other World Computing aka macsales.com. It has all the signs of a fake: light comes on instantly, light stays on after it is unplugged, wrong ID number, casing quality is poor, weighs 2ounces less than a real one, and other signs of a fake. They insist they are bought from Apple and real. However if you look up their Yelp reviews you'll see this is very common and in one case Apple verified the adapter was fake, yet OWC still claimed it wasn't. I no longer trust OWC and will not purchase from them again. So, REALLY THANK YOU VERY MUCH FOR GREAT WORK!! !